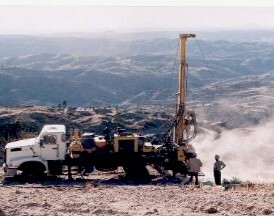 � 22.09.2010 - Ethiopia "on path to reach MDGs"
afrol News, 16 November - The Ethiopian government aims at doubling its still modest mining sector in the next five year. The Mining Ministry says the industry is "totally open" to foreign investors, with "no restrictions" at all. Gebre Egziabher Mekonen, head of the mineral operations department at the Ethiopian Mining Ministry, yesterday made it clear to foreign investors in the mining sector that the country would do anything to attract more foreign capital. "Ethiopia's government is aiming to license 50 mineral-exploration projects every year and more than double exports from the industry to one billion USD in five years," the official stated. According to government, investment in the Ethiopian mining industry had surged from less than US$ 100 million in 2003 to an accumulated US$ 1.3 billion. Mr Mekonen said "the sector has seen a dramatic change. Seven years ago, the West didn't know about our mineral resources." This had now changed. The Horn of Africa nation, which has deposits of gold, silver, copper, platinum, potash and tantalum, exported gold for a total value of US$ 281 million in the fiscal year ending 7 July, according to Mr Mekonen. Ethiopian-born Saudi billionaire Sheikh Mohammed al- Amoudi's Midroc Gold Mine and Australia-based Nyota Minerals Ltd both were planning large-scale operations in the country, he revealed. There are currently 80 international and local firms operating 160 projects, Mr Mekonen said. The industry was "totally open" to foreign investors, he added. "There is no restriction to any investment." According to the South African 'Mbendi' registry, there are however important regulations in Ethiopia mining investors need to know. Government retains title to all land and mining operations, which subject to national and governmental approval. Government further had the "right to acquire a 2 percent interest in mining ventures as well as a 35 percent income tax levy on all mining operations," according to 'Mbendi'. "Mining royalties include 5% on precious metals and 3 percent on other minerals." Mining exports currently earn Ethiopia about US$ 400 million annually, according to government, by now making the sector the second-largest foreign-exchange earner after agricultural produce. Government hoped this figure would rise to about one US$ billion after five years, Mr Mekonen concluded.